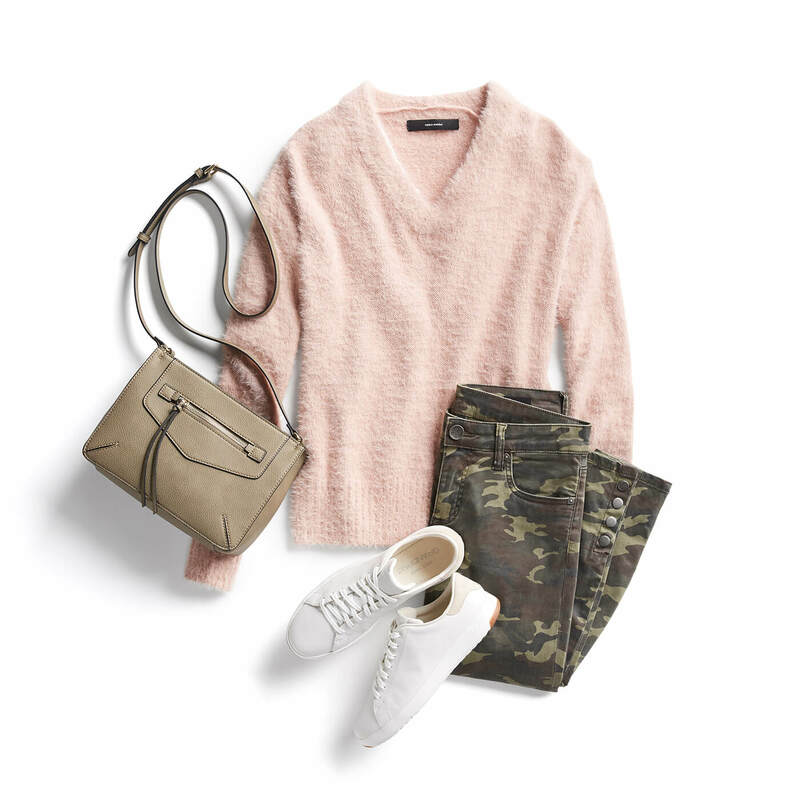 Here at Stitch Fix, we don’t think twice when getting behind a trend that is both stylish and comfortable. Chunky sweaters are comfy, warm and very much en vogue, but as a petite lady, your intuition might be telling you to keep them at arm’s length (no pun intended). Fortunately, you can keep them close this season with our chunky-sweater styling tips for petites! Scroll down to learn how to wear petite-friendly chunky sweaters! The more you expose your upper torso—meaning neck, shoulders and upper chest—the longer your frame will look. This is why turtlenecks aren’t ideal for petites, but V-necks, off-the-shoulder, boat necks, scoop necks and even non-bulky cowl necks can work! Stylist Tip: If it’s too cold to show décolletage (or you prefer a little more modesty), choose a V-neck pullover layered over a thinner crew neck or scoop neck knit—these lines are flattering even in the absence of skin. Remember: chunky is not the same as oversized. Look for a thick, soft sweater that will give you the cozy feel you want, but choose a fit that won’t overwhelm your frame. If it tapers towards your waist and hits right around your hips, you know it’s right for you. Go preppy with your go-to pencil skirt and layer over a collared button-up for an extra prim office look. Need more lengthening magic? Put those pointed-toe pumps to work! Styling Tip: If your heart is set on an oversized sweater, get it in petite sizing or try a size down. Complete with skinnies or leggings to balance out the proportions. The less contrast you have between top and bottom, the more streamlined and elongating your outfit will be. Pair your light wash jeans with a pastel sweater, or your black skirt with a rich eggplant shade. Thinking something more modern? Take it a bit further with a tonal outfit and try a dusty pink skirt with a light blush sweater. Front-tuck: slightly tuck the hemline’s center front and give it a little tug for a carefree finish. Half-tuck: slightly tuck in one side, right around your hip bone, and tug it lightly for that laid-back vibe. Full-tuck: if you’re wearing an A-line or a midi-length skirt, tuck the sweater all around for a tapered fit (tugging is optional). If you enjoy emphasizing your waist, add a chic belt! When you’re wearing a chunky sweater, sometimes your waist can get lost in the knit. As an alternative to tucking your sweater, look for a woven skinny belt—so you aren’t limited by punch holes—and wrap it around your natural waistline. For a tidy finish, loop the belt’s end back over the buckle and pull it down to your desired length. You can slightly tug the sweater above your waist for that I-just-put-this-together-on-the-fly finish. Bear with us here! 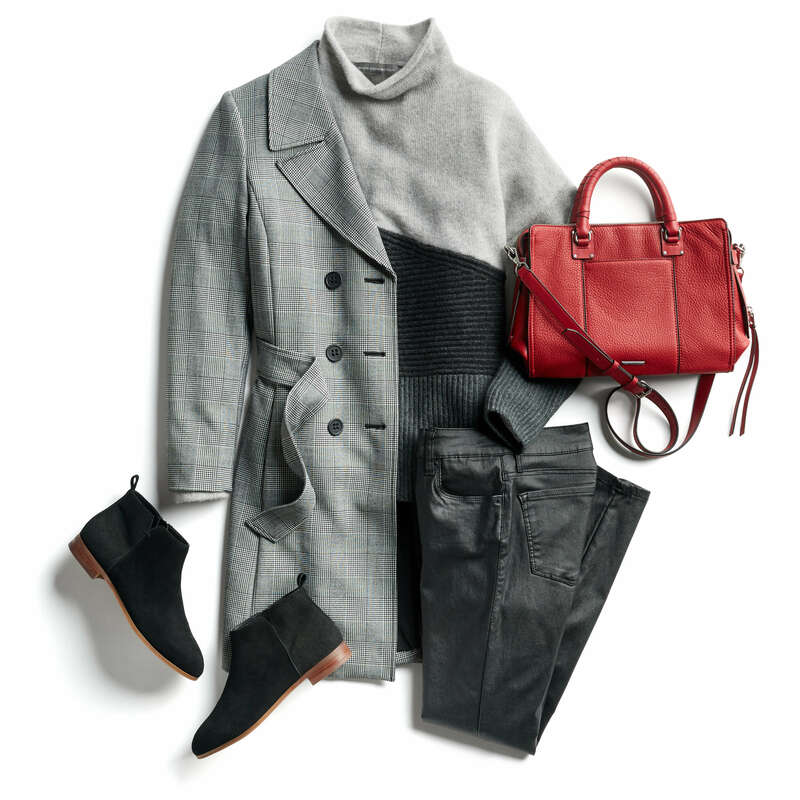 We now adding another layer might seem counterintuitive, but if the weather is frightful, don’t hesitate to try a duster vest or coat over your sweater—you will instantly recognize those lengthening lines you’ve now begun to master. Chunky sweaters are as close as we’ll ever get to being wrapped up in a cloud, so why should anyone ever be deprived of that pleasure? With these simple tips, you’re now ready to stock your closet with these heaven-sent staples. We’d love to know how you style your chunky sweaters. Share in the comments below!